Our Sports Hospital has state-of-the-art medical imaging units, where we carry out X-ray and ultrasound scans as well as examinations using our patient-friendly MRI and CT scanners. At the hospitals’ radiology units, examinations are tailored individually to each patient. Our focus is on swift, high-quality service in a peaceful environment. Our radiographers are available throughout our opening hours to answer any questions concerning medical imaging. For instructions as to how to send existing X-rays and MRIs to the hospital, please contact us at info@sportshospital.com. Our world-renowned specialists are ready to help you. Our CT scanners are specifically designed for detailed examinations of extremities. The devices implement X-ray cone-beam technology, and therefore produce significantly lower radiation doses than standard CT scanners. The devices can be used for imaging of e.g. knees, ankles, feet, elbows, wrists and hands. CT scanners can be used for: diagnosing or ruling out fractures, closer analysis of the position and extent of the fracture, assessment of fracture healing, detailed analyses of cartilage lesions and their healing Cartilage is clearly visible in CT scans, especially if contrast medium is injected into the joint cavity. Examinations of the lower extremities can also be carried out in weight-bearing, i.e. standing, position. Magnetic resonance imaging (MRI) is a widely used imaging method for examining the body’s soft tissues in particular. 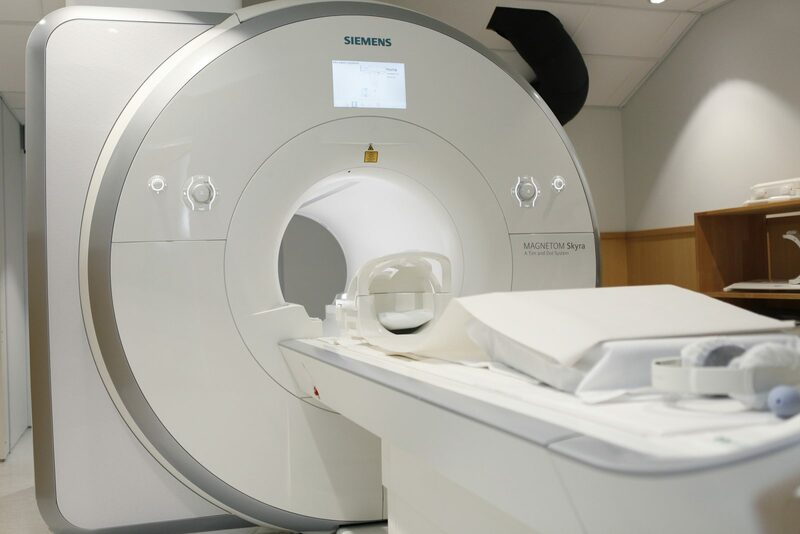 Our hospitals are equipped with patient-friendly MRI scanners. Our MRI scanners represent the state of the art in their field in terms of both technology and patient comfort. The scanner can be used to examine any part of the body, but it is especially suitable for the brain and spine, larger joints, blood vessels and the abdomen. One of our MRI scanners is used to examine extremities, typically upper limbs below shoulder level and lower limbs below thigh level. The open design of the scanner makes it especially suitable for patients suffering from claustrophobia, as the examination can be carried out in a seated position. Despite the high magnetic field strength, the machines are very quiet. X-ray scans are available immediately, with no waiting times. X-rays are still the front-line diagnostic tool for studying bones and joints. Our fully digital X-ray images can be analysed immediately after the scan. This minimizes the need for different X-ray views, and thus reduces the radiation load on the patient. Results are at the clinician’s disposal immediately, which makes it possible to start treatment without delay. Ultrasound scans are carried out by expert radiologists at our hospitals. In orthopaedics, ultrasound imaging is a useful addition to other imaging methods, especially when examining muscles, tendons and other superficial soft tissues. During an ultrasound examination, it is also possible to perform tissue biopsies and administer injections precisely into the targeted tissue.